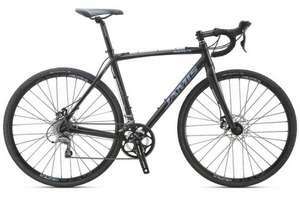 Decent Cyclocross bike with awesome reviews from a reputable company now been reduced to 400 quid from 480! Huge huge waste of money. Awful brakes. And I mean awful. They never work and glaze easily and so prone to overheating. Also the rotors are very bent usually and you can't adjust the brakes very well. the pinnacle is a much better buy, with much better components. avoid this and buy that. No arguing with you but if the brakes are than bad do you think you just got a bad set ? How many have u ridden on to make this judgement? So many bikes to choose from, anyone recommend one for maybe odd pavement use until I get use to road and through forest and woods etc... not going to do jumps or anything lol but over odd bumps etc. By the time you have the monies op methinks offer will have gone. For £730 it should be. So many bikes to choose from, anyone recommend one for maybe odd pavement … So many bikes to choose from, anyone recommend one for maybe odd pavement use until I get use to road and through forest and woods etc... not going to do jumps or anything lol but over odd bumps etc. These cyclocross bikes, what terrain can they handle, the only pictures I ever see are in wet muddy school fields on circuits, can they handle real off-road. I have a Giant TCX CX and ride it around Cannock Chase and the Peaks on occasion. They are very capable but not a mtb replacement for me. You can ride stony roads and bridleways and the like but on technical terrain it can get a bit lairy. I have rode the odd lap of the FTD and Monkey trail on mine but had to hop off for rock drops. I also have been known to go over the bars on occasion too. Great bikes for training on as you can just blast up the roads and see a gravel road or track and go check it out though. If you are a skilled rider you could probably ride anything on them without too much fuss. I have a Giant TCX CX and ride it around Cannock Chase and the Peaks on … I have a Giant TCX CX and ride it around Cannock Chase and the Peaks on occasion. They are very capable but not a mtb replacement for me. You can ride stony roads and bridleways and the like but on technical terrain it can get a bit lairy. I have rode the odd lap of the FTD and Monkey trail on mine but had to hop off for rock drops. I also have been known to go over the bars on occasion too. Great bikes for training on as you can just blast up the roads and see a gravel road or track and go check it out though. If you are a skilled rider you could probably ride anything on them without too much fuss. Deal posting newbie! This is olliemad5 first deal post. Help out by leaving a posting tip or just to show your appreciation for their contribution.